Many features of the cranium of A. africanus are more evolved than that of earlier A. afarensis. These features include a more globular cranium and slightly higher ratio of brain size to body size. Also the teeth and face appear less primitive. For years researchers considered the evolution of early humans to pass from A. afarensis to A. africanus and lead to early Homo. However, some researchers now believe that facial features link A. africanus to the "robust" early human species of southern Africa, Paranthropus robustus. Known as anterior pillars, which are located on either side of the nose, these features are found in A. africanus and P. robustus, and not in the eastern African species. This implies that the designation of the genus Paranthropus may be incorrect. As if to confuse the issue even more, recent comparative studies of the postcranial fossils of A. afarensis and A. africanus have placed a whole new unknown into the question. Evidently, the proportion of arm to leg lengths was more ape-like in A. africanus than in A. afarensis. This confuses the phylogeny of early humans because of the discovery of the OH 62 fossil, and the post-cranial paradox it has posed. As a result, some researchers are once again pointing to A. africanus as a possible ancestor of early Homo. In all, A. africanus is an enigma to paleoanthropology. Researchers are still unsure about where A. africanus came from and which species, if any, it led to. It can safely be said that to figure out A. africanus would lead to a great clarification of our early evolutionary history. The OH 62 fossil was found on July 21, 1986 after an invitation by the Tanzanian government to the Institute of Human Origins to reopen the excavations in Olduvai Gorge. No one expected to make a find on the order of magnitude of the OH 5 "Zinjanthropus" discovery of 1959, yet only three days into the excavations, early human remains were found. The skeletal remains that the researchers found were, for the most part, fragmented beyond the point of reconstruction. However, several diagnostically important portions of the body were able to be reconstructed. These included the maxilla, the proportions of which enabled researchers to identify OH 62 as Homo habilis. Researchers also deduced that OH 62 was an adult at death (based on the presence of the third molars), and probably an old adult (based on the degree of wear on the tooth crowns). Additionally, the long bones of the arms and legs were able to be reconstructed sufficiently to allow accurate measurements. In OH 62 it was possible for the first time to firmly associate upper and lower limb bones of a fossil individual who lived just under 2 million years ago. And it was in OH 62 that many of the assumptions of researchers would be overturned. Homo habilis has been considered ancestral to modern humans through Homo erectus. The limb proportions were thought to be similar to modern humans. The KNM WT 15000 skeleton (a nearly complete juvenile), which was found in 1984, showed that African populations of Homo erectus (Homo ergaster), only 200,000 years after H. habilis had modern limb proportions. Yet, the OH 62 skeleton has given researchers more questions than answers because of its surprisingly ape-like limb proportions. In people today, the upper arm bone (humerus) is considerably shorter than the upper leg bone (femur). In modern apes, the humerus and femur are nearly identical in length. Paleoanthropologists can quantify this difference using a measure called the humerofemoral index, which is defined as the length of the humerus divided by the length of the femur times 100. If the humerus and the femur are nearly equal in length, the index equals 100. If the femur is much longer than the humerus, then the index is a lower number. In OH 62, the humerofemoral index was 95; the upper arm was nearly the same length as the upper leg. For comparison, modern humans have a humerofemoral index of 70, and chimpanzees have an index of nearly 100. This means that Homo habilis had a body structure much more like an ape or Australopithecus afarensis, than a modern human. Additionally, as an adult OH 62 had only reached a stature of 1 meter or 3 feet tall. This makes OH 62 the smallest adult hominid to have ever been discovered. It also implies that OH 62 was female, and that there was a significant amount of sexual dimorphism, again, more like apes or A. afarensis (strongly dimorphic) than modern humans (not so dimorphic). Neither of these realisations were expected. OH 62 has raised more questions than she has answered. Where did the later species of Homo come from? 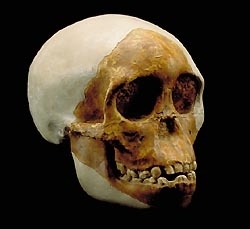 Cranially, Homo habilis is more similar to later Homo, and many consider this to be the true lineage. But the emergence of early humans with modern body proportions in a relatively short time, while not impossible, gives some researchers cause for concern, and they look to other lineages, such as Homo rudolfensis. Additionally, this confuses the evolution of early humans at the level of Australopithecus afarensis and A. africanus. Which lineage gave rise to later Homo? The body proportions of A. africanus have been found to be more ape-like than the earlier A. afarensis. Paradoxically, this may place A. africanus as the ancestor of Homo - if, in fact, the early members of our genus had ape-like body proportions like OH 62.